Includes one 6' or 8' table (without covering), chair and one ticket to the luncheon. Please let organizers know if you need access to electricity. Listed in program as Event Sponsor. Includes ten luncheon tickets, one exhibit table and program mention. Listed in all marketing materials/invitations/social media as Food and Beverage Sponsor, full page ad in event program and stage recognition. Includes 1 table of ten for the luncheon and 1 exhibit table. Listed in all marketing materials/invitations/social media as Marketplace Expo Sponsor, full page ad in event program and stage recognition. Includes 1 table of ten for the luncheon and 1 exhibit table. This inspirational and transformational community luncheon gives voice to the power of living openly, honestly and with authenticity at work, in our families, in our faith communities, and across our lives. The realities of living an authentic life are deeper than being "out". We all have many layers of identity and we must work together to create a world where people can bring their "whole self" to everything they do. The National Coming Out Day Luncheon serves as a celebration of who we are individually...and together! The tide of history will continue to change only when we honor our identities with pride and live with joy, openness and truth. Coming out (whether as lesbian, gay, bisexual, transgender, ally or any other identity on the spectrum) STILL MATTERS. Every person who speaks up continues to change hearts and minds, and creates new advocates for equality. We hope you will join us as our community celebrates the strength, courage and wisdom of LGBTQ+ and Allied people who have braved their own unique journeys to now live openly and authentically...and with pride. Quorum depends on the generosity of our sponsors to continue to provide the highest level of quality services to our members. 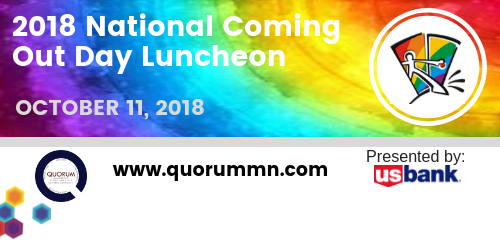 Please consider becoming our sponsor of the National Coming Out Day Luncheon.. Sponsoring the Luncheon is, in fact, a brilliant marketing strategy. In this climate of shifting marketing budgets, reductions in every sector, and a deluge of "buzz word" messaging from competitors, an effective alternative has become being an event sponsor. 1) Develop and enhance credibility in a target market-This is an opportunity to build rapport and trust with customers, prospects and the community in general! 2) Highly targeted marketing-large events such as the Luncheon have a variety of attendees across sectors. Sponsorships allow you to create and utilize a targeted marketing strategy that automatically puts you head and shoulders above the competition. 4) Brand awareness and recognition-Logo placement in a variety of places such as flyers, direct mail, brochures, websites, email marketing campaigns, tickets, signage, etc. will add to increase brand awareness. Being recognized as a sponsor will communicate value and support with the audience at the event. 5) Community support-Involvement in community organizations demonstrates your concern for the community in which you live and shows that your business supports certain community-related issues. This can significantly improve your organization’s public image, as well as help build goodwill in your community. Please email rebecca@twincitiesquorum.com with any questions!